Saving the Bees in Oklahoma! Watch the Video! What can be done to help native and honey bees thrive in Oklahoma? Scroll down to watch this special report from Scott Thompson on Tulsa’s News on 6 (KOTV, channel 6) and see the center’s beautiful pollinator-friendly landscape! The Emmy award-winning reporter and news anchor visited the Kerr Center for his report, which aired on Thursday, July 9, during the 10 p.m. newscast on Channel 6, and also during the 9 p.m. newscast on KOTV’s sister station, Tulsa’s CW (Channel 19). He interviewed David Redhage, who heads up the center’s pollinator project and visited with attendees at our June pollinator workshop and the Xerces Society’s Ann Stine. There is no disputing that honey bees are in trouble, and have been for years, due to habitat loss, pesticides, mites and the mysterious colony collapse disorder. The 4,000 North American species of native bees are being looked at to fill the gap. But they too are suffering habitat loss. Development, mowing of roadsides at the wrong time, and careless pesticide use kill native bees like bumble bees, too. Preserving habitat for native bees will also benefit honey bees. 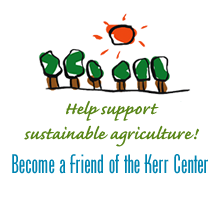 The Kerr Center has been protecting native plants wherever it can, and has established an office landscape of largely native plants, grasses, shrubs and trees. The plants are labelled for visitors and we have held several workshops on native pollinators. https://youtu.be/I3gI_tuc1uQ In this segment, from its August 6 episode, "Oklahoma Gardening" takes a tour of the Kerr Center horticulture program's elderberry plantings.